Not all dishes in Italy are alike. 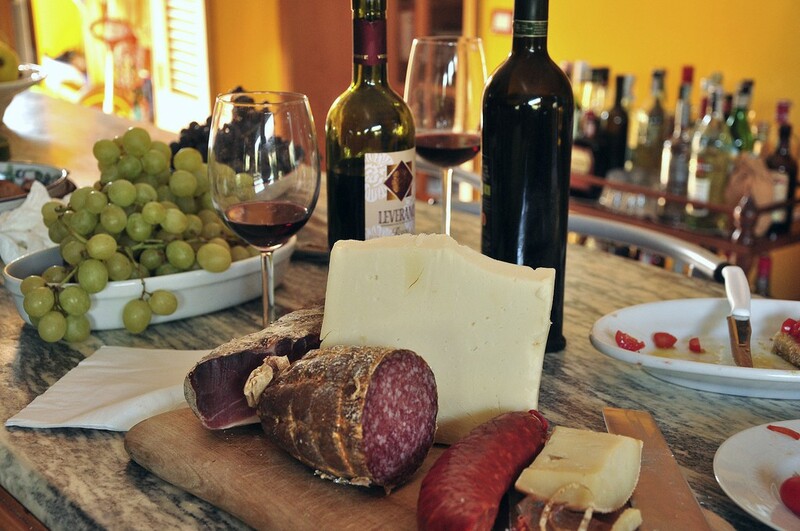 It may seem like the same pasta and pizza, but every region has its own specialties. 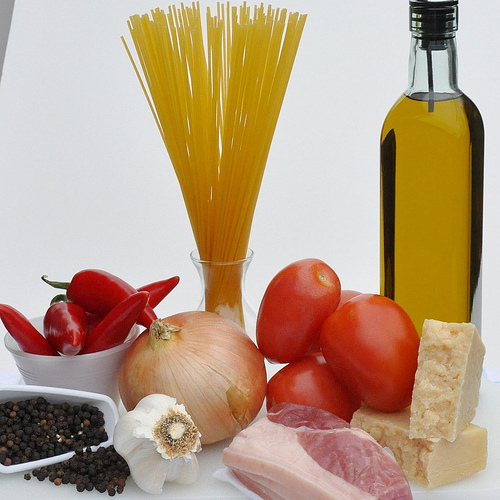 Each region is as fanatic about their dishes as they are about their soccer teams.Like proud parents, I found that Italians boast about these dishes and how the local ingredients impart a flavor “impossible to replicate” anywhere else in Italy, let alone the rest of the world. I ran into these proud locals everywhere in Italy, and Rome was no different. Rome’s just bigger, so there are more local dishes and more braggarts. From these braggarts I learned the nuances of each Roman pasta dish and a few places to eat them in the eternal city. Key ingredients to several Roman pasta dishes are Pecorino Romano cheese and guanciale (meat from the pig’s jowl). Pecorino Romano is a hard sheep’s milk cheese, similar to Parmigiano, but it’s sharper and saltier. Guanciale, similar to pancetta but made with the pig’s jowl instead of belly, is sweeter and has a more fatty flavor. Purists believe the pasta dishes of Rome are not authentic without it (no pancetta substitutions for them, and I tend to agreen, especially in the case of l’amatriciana.). Chili peppers (peperoncini) and black pepper are typically used in many of the dishes, too. There are two types of pasta in Rome that aren’t as prevalent elsewhere, bucatini and tonnarelli. Bucatini (which translates to little hole) is long pasta, a little thicker than spaghetti with a hole in the center. You cannot slurp up the long strands, so you better get deft at your pasta and fork twirling before eating this without making a mess. Tonnarelli is a thicker, more squared, version of spaghetti. When you find a restaurant where they make it in house, many times in the cacio e pepe dish, it’s a good bet to order it. You’ll also see spaghetti, penne, and rigatoni, as you would throughout Italy. 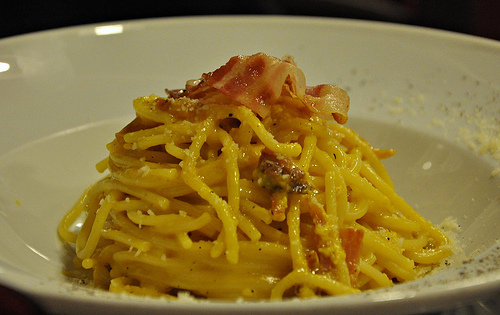 Bucatini all’ Amatriciana – After carbonara, this may be the next most popular pasta from Rome. It’s made with guanciale, pecorino Romano cheese, tomatoes, chili peppers (peperoncini), black pepper and a little wine. Purists will say that onions do not go in this dish, but many places add them. Guanciale is the key to this dish; and pancetta shouldn’t be substituted here. Cacio e Pepe – A spicy version of the American mac and cheese. Two ingredients added to the pasta – pecorino and black pepper combine to make a creamy and peppery sauce. Rigatoni con Pajata – An ancient dish and part of cucina povera (food of the poor). It has a tomato-based sauce made with intestines from a suckling lamb. The milk has just begun to digest (ok, don’t think about it, just eat it) adding a ricotta-like consistency, sweetness and milkiness to the sauce. Gnocchi di Patate – Gnocchi made from semolina flour is Roman, but wait for Thursdays. On Thursdays many restaurants in Rome make potato gnocchi fresh and in-house. Known as Gnocchi Giovedi (Thurday Gnocchi), these are the gnocchi of Rome I prefer. Pasta alla Coda Vaccinara– Ragu made from braised oxtail stew. It’s rich and dense, with a deep meaty flavor. One of the best meat sauces I’ve ever tasted. Like any other tourist city, Rome has its traps, too many of them in the center . 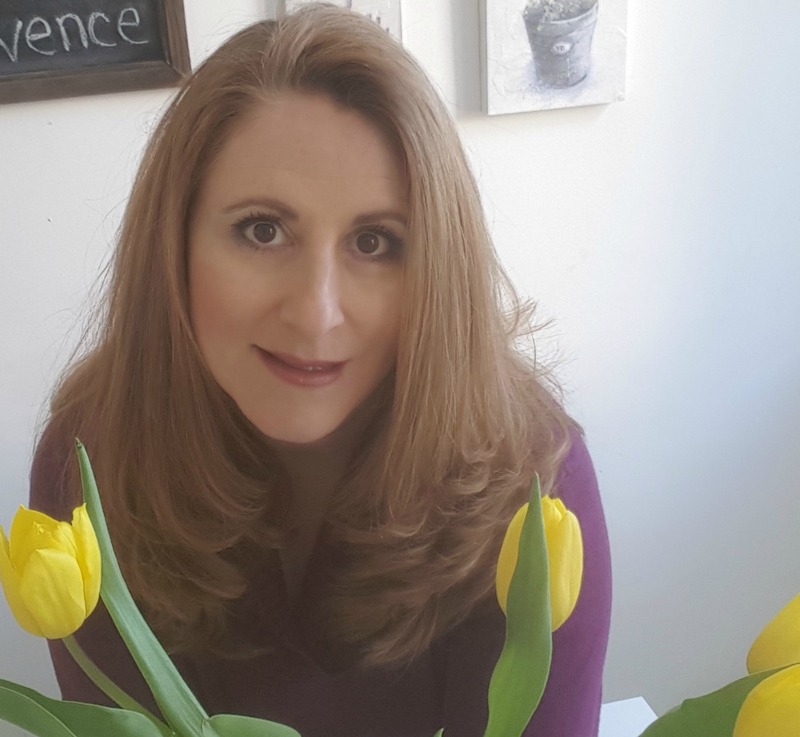 I’ve been lucky to get guidance from Romans, expats and other bloggers in Rome. 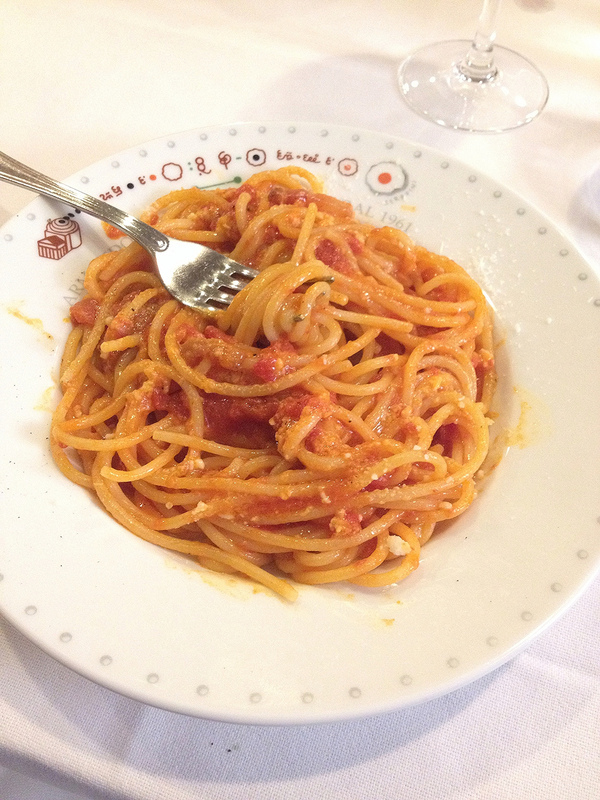 Below are 10 of my favorite spots for eating some of Rome’s delectable dishes of pasta. Da Danilo – (Via Petrarca 13) One of the best carbonara in Rome. This trattoria, a little away from the center in Esquilino, serves up traditional Roman pasta and secondi. Da Cesare al Casaletto – (via del Casaletto 45/ Tel. 06536015) – Outside the city center but a super easy tram ride away for one of the best meals you’ll have in Rome. All their Roman pasta dishes are great, I especially loved their la gricia with artichokes I had there during April. (Also a very good value: I had antipasti, primo, secondo, wine & their creme caramel for dessert and the bill was 40 euros) – Take the Tram 8, from Largo Argentina or along Viale Trastevere, going in the direction of Casaletto. Exit at the very last stop. Once you exit, the restaurant is on the first street to your left and within view from the tram stop. Osteria Fernanda – (via Ettore Rolli ) – They do the L’amatriciana a little differently than the traditional, but I do love the loads of crispy guanciale they top on the pasta. They also offer a very reasonable tastig menu at 35 euros (and another at 45 euros). Felice a Testaccio – (Via Mastro Giorgio 29 in Testaccio ) First time there, I tried to walk up and get seated. I was alone and clearly a foreigner, so they didn’t seat me, even though there were plenty of empty tables—all with reserved signs. After several phone attempts I was successful. I think only because my Roman friend called to make reservations and joined me. All the pasta plates are fantastic, especially the cacio e pepe. They have an award-winning tiramisu’ that is a decadent end to a great meal. 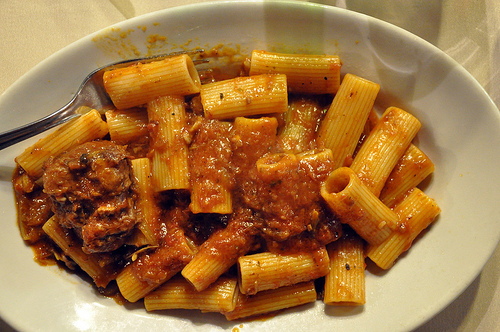 Capo di Ferro – (Piazza San Cosimato in Trastevere) Dense, rich and meaty rigatoni alla coda vaccinara was awesome. A very casual trattoria owned by two brothers (one in the kitchen, one in the front), they also make a good bucatini all’ amatriciana and la gricia. It’s just north of the piazza with few tables outside and several inside. Roma Sparita – (Piazza Santa Cecilia in Trastevere) In 2009, I was told by several Romans this is the place for Cacio e Pepe in Rome. At that time, it was and it was delicious, so I included it in my original post. Served in a Parmigiano cup/dish, Cacio e Pepe is still a signature dish there, especially after it was featured on Anthony Bourdain’s, “No Reservations: Rome.” I have not been back since 2009, but have heard very mixed reviews both about the dish and the restaurant. Very interesting. Now I’m starving. Thanks for the trip. Looking forward to the next post. This is a great post! I’ll have to keep those restaurants in mind the next time I go to Italy. In addition to what you wrote, Pasta alla Carbonara is traditionally made with bucatini (which actually means little holeS (plural)) instead of spaghetti. Lastly, all these pasta shapes are in the plural form because in Italian, “s” is not a plural marker as it is in English and some other languages; instead the “i” or the “e” indicates plurality. My favorite dish was the Carbonara, but I first tried it in Venezia. YUM! I’ll never forget it. Congratulations Kathy, that is a pretty respectable list of the specialties of Rome – my town. Excitedly waiting for the next installment! The photo of “THE FORKFUL” is wonderful – great job. Memoria: Thanks for the note on plurality in Italian—-it’s impossible for me to write “pastas” knowing this….I do sometimes slip and say “raviolis” though. I just saw this on Facebook today and it looked familiar … well, some entries are worth repeating! This one definitely is a keeper.